Day 1 afternoon was reserved for department visits. While most of us walked a few steps to their respective departments, we, the metallurgy folks, had to make a longish journey. There were 11 of us, some having travelled from the USA and Hong Kong. Most of the department faculty was present at the entrance to welcome us and we were ushered into LT-1, the largest lecture theatre in the department. I did not mention it to the others, but I had a distinct feeling of unease as we approached the department. Even at the best of times during my BHU days this trip was hardly looked forward to. And this one, after 25 years, was even more tense. I had this fear that one of the professors would catch hold of me and ask me to draw the “Iron-Carbon diagram” on the black-board. For those not familiar with this monstrosity, let me briefly explain it simplistically to you. It is a plot of what happens to iron with increasing percentages of carbon (X-axis) and increasing temperature (Y-axis). Iron being iron occupies a fair share in metallurgy curriculum. And the iron-carbon diagram is what any self-respecting metallurgist should know like the back of his hand, so to speak. The diagram always spooked me. Did I say monstrosity? Well make it a dinosaur. Actually make it two dinosaurs- entwined in a post-coital embrace. Lest you start worrying about my stress levels, let me assure you that I was spared this question. But before you heave a sigh of relief, let me hasten to add that what transpired was even more stressful. The faculty asked the 11 of us to occupy the chairs already placed on the dais while they (and some students) sat in the audience. We were required to fill them in on our lives of the past 25 years! A cold shiver ran down my spine. 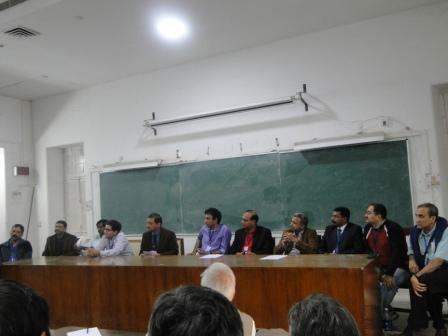 Here I was, facing our professors, some of the most illustrious names in metallurgy research and education in India. And to make it worse, of the 11 of us on the dais, nearly all were involved with metallurgy, or at least with engineering. Just two exceptions: Sethi sells insurance products in Hong Kong and I am peddling medicines! Many of the others were Ph D’s. Some are even famous researchers. Including the rockstar of the ‘85 batch, P. M. Ajayan, the chap with mentions in the “Guiness Book of World Records”! I was the last to introduce myself. Fumbling for a suitable angle to justify my days at the department I made a weak joke about how I can take part credit for the success of Ajayan. I am sure the joke was not well received by the audience. (I said that after a listless first year performance I decided to do “something” in the 3rd semester. I studied hard and ranked among the top 3 of the class. Ajayan felt threatened and decided to work even harder. And that was the start of the rise of Ajayan the famous researcher!) I also mumbled something about how the department prepared us for the real world….. Anyway, I thought I escaped pretty unscathed from the department visit, it could have been really bad! The IT-BHU metallurgy department has a name, and for good reason. They are thorough and meticulous. And it was not different in this visit. 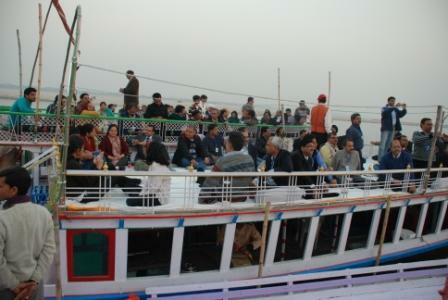 So much so that the meeting got prolonged and some of us missed the boat-ride along the Ganga starting at Assi Ghat. Well nearly so! A quick call to Anshu ensured a rescue boat for the four of us laggards. And soon we joined the four bajras tethered together facing the imperious- and the very famous- Dashashwamedh Ghat. Actually we were in the middle of two ghats, the name of the other eludes me now. But each ghat had its own Ganga aarti which started soon after dusk. The beauty- or shall I spectacle- is something to be seen to be believed! 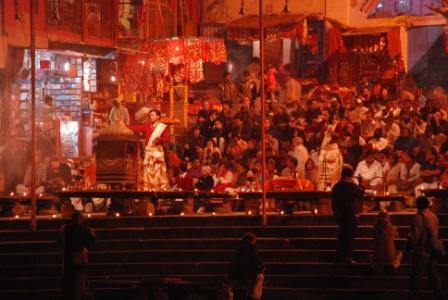 Dhoti-clad and bare-chested young men holding ceremonial lamps performing various pujas and rituals to Ganga with shlokas blaring from the audio system. Our cameras were going berserk capturing the scene. The spectators sitting on the four bajras were going berserk on something else too. Anshu had lined up a series of utterly delicious snacks for the evening. A never-ending stream of chaats of multiple varieties, gulab jamun, thandai and many others whose names I do not remember now. And to add to the “picnic-y” feel, packets of roasted peanuts were handed around to the group. When we were finally brought back to terra firma at Assi Ghat, I heard someone say whether anyone will be hungry enough to have the dinner at the party later that evening! I had heard from Anshu that the place he had booked for the dinner for both nights was a decent place, but he had not prepared me for the grandeur of the place. Kuber Complex is located at Rathyatra, just a stone’s throw from Sigra. It houses some fancy showrooms and the top floor has the banquet hall. We enter the banquet hall and the first thing which stuck me was the sheer size of the hall. And the seating arrangement, banquet style, promising something grand to follow. The hall was done up with hundreds of balloons, blue and white. Also in hundreds were the food counters lining the walls of the hall. Across the expansive hall from the entrance was a stage complete with mattresses covered with sparkling white sheets. We were late for the party, or so I thought. There were hardly a handful of people in the hall. We were not late, I heaved a sigh of relief! But the relief was short-lived when I walked towards the stage end of the hall. There was a large lawn adjoining the hall where most of the gang was busy catching up. And then I saw the magnificient bar with busy bar-tenders tending to parched throats! I had suspected initially when Anshu’s name came up as the organizer that Anshu, being what he is, would interpret drinks as sherbet, milk, lassi and thandai. Thankfully, he remembered that there were others in the group whose tastes in drinks went beyond the chaste ones mentioned above. And the lawn was also very helpful to people with the other common vice- the smokers! One could smoke in peace there and not have to take the trouble of taking the lift downstairs to the ground floor. And for even more dedicated “smokers” there was a helpful niche in the lawn area and soon enough a dozen-or-so had gathered there, reliving the days of the past even more intensely! Not all action was happening in the lawn area. 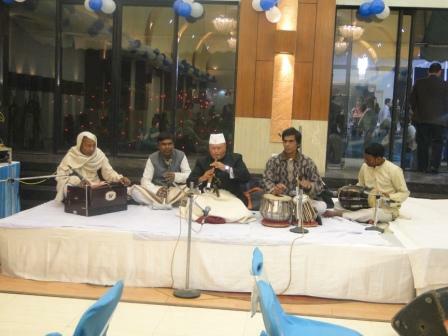 There was entertainment lined-up for the attendees, Zaamin Khan, the son of the legendary shenai player from Varanasi, Bharat Ratna Bismillah Khan, was at hand to entertain the guests. 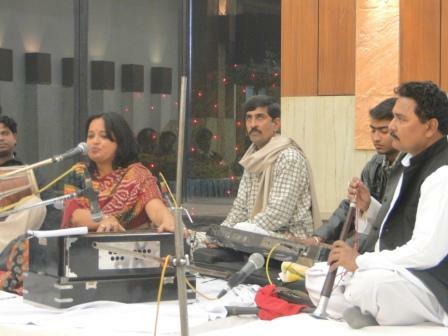 After an hour or so, he was followed by a singer from Lucknow, Alpana Mehrotra, who sang many popular folk songs. She was accompanied by yet another shehnai player (from Lucknow), Saahibe Alam. The magic of Alpana’s singing was such that over time she managed to pull in a bulk of those in the lawns into the hall. It took Manoj Prasad (V Mining.) to make the only audience request to the singer, he wanted her to sing “Baarah maasa”, a popular folk song. To which she obliged, albeit briefly. She sang the chau maasa! Manoj’s crib at the end of the show was that the singer did not cover all the twelve months in her version. If the spread at the lunch that day took us by surprise, we were now positively astounded at the elaborate fare at the dinner. Sample this: tikka (both paneer and chicken malai), kababs (both mutton and mutter), fish fingers, and babycorn for starters. Anshu would have thought this was not sufficient so he had carried with him in his car from Lucknow tons of semi-cooked Kakori kabab which were ‘finished” at the venue and served. A choice of multiple dishes as main course (veg biryani, chicken biryani, burhani raita, gilaoti kababs – veg and non-veg., paneer mughlai and chicken mughlai….the list was seemingly endless). Throw in some soups and salads and multiple varieties of rotis for good measure. In case you had a sweet tooth, you could partake of a sweet platter consisting of lawanglata, jalebi, imarti, malpua, gulab jamun and rasbhari served With hot rabri. Or you could have a baked malai boondi or a malai pista sandwich. In case you had an adventurous palate (considering it was really cold in Varanasi) you could even have the flavoured seekh kulfi. All through my dinner, I was studiously trying to avoid the disapproving glare of my wife. I knew I would get an earful when we would return to the hotel room. And I did. She yelled, “Eating all those sweets and the fatty rich food! Come on, you are now in your late 40’s. Behave like one!” I wanted to say I was in my early 20’s, this was 1985 afterall. But I dare not. All I could mutter as I got into my razai looking forward to a night’s rest that once I return to Bangalore I would eat only dry rotis, boiled veggies and salads. And, no sweets, ever!